2Lt Harry J. Cook (CP) - Stood down on missions 219 and 220. Experienced combat orientation CoPilots used on these missions: 2Lt John R. Helms (219) and 2Lt Costa Markos (220). 2Lt Malcolm M. Fouts (B) - Stood down on mission 226. 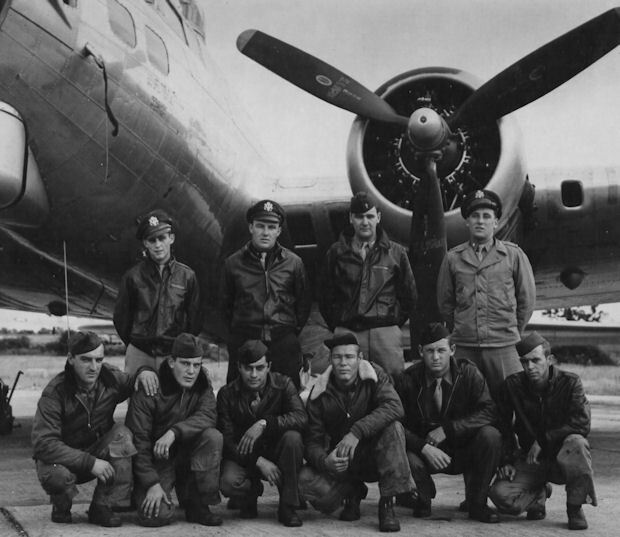 A substitute Bombardier, 1Lt Lowell L. Rickey was used. (KIA-POW) On 15 August 1944 Mission #229 to Wiesbaden, Germany in B-17G #42-31183 Bad Penny (359BS) BN-J. Coming off the target Bad Penny was the first of nine 303rd BG(H) B-17s to be downed by 25-30 ME-109s and FW-190 German fighters. Bad Penny exploded in mid air. One burning wing crashed into Seinsfeld and set some farmhouses and barns on fire. Reuss (N) - Landed near Preist, Germany. He was caught in a tree by his chute and tried to unbuckle himself. Two unarmed German soldiers tried to help him. A local Nazi party man arrived and shot Lt Reuss. Two other German civilians then beat him to death with a club and hammer. These three men were found guilty of murder at a 29 June 1945 war crimes trial and were hanged. A "Landwacht" (Home Guard) man who watched the murder was also sentenced to death but his sentence was changed to life at hard labor. Goss (P) - Upon landing was surrounded by hostile civilians who were shouting and brandishing all manner of farm implements. A small girl, 8 or 9 years old, approached and Lt Goss gave her his flying boots. He was then taken to a constable's office where his wife gave him a slice of bread and a beer. She grabbed the beer from him when a very agitated woman came rushing into the room screaming. He was then placed in the hands of the nearby armed German soldiers..
Earon (BT) - Was badly bruised and bloodied from a vicious beating after he landed. He died in 1951 as a direct result of the beating he received at the hands of his captures. Rocco (R) Was captured and jailed at the Indenheim police post. The next day, while being transported to Bitburg, the escorting policeman shot and killed Sgt Rocco for an unknown reason. Witnesses claimed he was trying to escape. A war crimes trial in August 1945 resulted in the policeman being sentenced to life imprisonment, which was later reduced to two years. Read the War Crimes Trial Transcript here. Mettauer (WG) - Was not on the 15 August 1944 mission. He had been removed from the crew when the crew size was reduced from 10 to 9 men.